In knowledge era enterprise needs an effective approach to create more knowledge caused of dynamic external business needs, wants and expectation. Knowledge strategy as value relationship between employee, system and customer should be evaluated periodically to keep enterprise’s capacity to deliver product and service dealing with cost, competitive value advantage and time as triple crown objectives. To grab the market, exploit it and win the business speed of knowledge (who know how) creation is one of early initiative to solve the problem, improve and remove internal process effectively based on customer expectation and strategy focus organization. However this organization’s level of strategy can not be copied from best practice implementation from benchmark competitor as differentiation that difficult to imitated to lower level as team learning and personal mastery of individual level. Dynamic situation produce a lot of silo information and challenges as barrier to create shared context (ba) as essential place for knowledge creation such of externalization (metaphor and analogy) and combination for internalized innovation and continuous improvement. Competitive advantage should be built from individual, group, organization and external entities ontologically. How can we use simple way and daily practice to overcome this complex relationship problem? Is there any practical wisdom to create effective solution for here now need rather than then there normative management approach to align with organizational strategy objectives? We do from what we think and we get from what we do. The first step toward this solution’s journey is using same structured approach logic of thinking, writing, problem solving and presenting as effective shared context and communication as knowledge socialization in individual level based on organizational problem issue. This personal mastery based on knowledgeable enterprise mission will build wining and learning team that can externalize their expertise to create new knowledge to fulfill organizational nutrition to survive, growth and sustain. 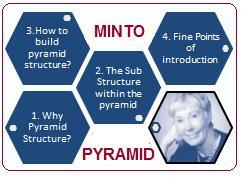 One of practical methodology known as “Minto Pyramid Principle” that use simple classic pattern of story-telling-Situation-Complication-Question and Answer (SCQA) that using pyramid as natural sorting information in human brain memorizing work. The mind cannot hold more than about seven items in the short term memory at any on time, so it start to group them into logical categories to be retained. The mind naturally sorts information into pyramidal groupings to comprehend it. Ideas that arrive pre-sorted into pyramids are more easily understood. A pyramid structure should therefore be the natural form for communicating. In telecom enterprise’s context, this structural logic can be aligned with structural pyramid process dealing with eTOM as organizational network analysis. Vertical and horizontal relationship can be used as effective shared context that enriched with effective logical of thinking and problem solving. This value relationship will force enterprise to create more solution and improving internal process and capacities to response dynamic market to win the business. We work in agile organization that response Third Generation Knowledge Management (TGKM) dealing with value relationship management in social networking era that move towards Forth Generation KM (FGKM) that more aesthetic, relationship, subjective practical wisdom knowledge creation here now rather than there. It is not only focus on financial profit but keeping in balance more social profit as an peace and harmony networks. There is another domain that react as compensation of this rapid change of social capital value from Web 1.0 towards Web 2.0 even Web 3.0. From Information resource, high role of collaboration and affect decision towards more generate new information based on semantik web and personalization. Scientific Management that focus to control all process for valuable service to customer will move forward to Customer Expectation Management. Find the best trade off between inside out and outside in approach to win the successful outcomes. Web 2.0 represent the power of hidden social network that should be align with enterprise strategy dealing with how service can be deliver based on triple crown principle: quality of services, cost and delivery time. One of important issue in Knowledge Enterprise is service standardization to make integration easier based on valuable partnership interdependently and using the same shared context to create knowledge and enrich service differentiation to win the business. eTOM as global generic process shared context take a benefit role for improving process out come especially in first level of organizational value. Most of standardization is product of not profit organization based on community of practice that tend to decide critical issue with best consensus as market driven as Web 2.0 evidence. This value driven force to network provider more flexible to manage internal resources and fit service delivery requirements with global service standardization as value relationship that change in dynamic customer need, wants and expectation. Service standardization itself force to more flexible, manageable and customize package that shift their role from inside out domain toward outside in valuable shared context should be achieve in continuous improvement effectively. eTOM has a wide range of process library vertically and horizontally that used as best process shared context with knowledge creation dealing with value relationship among information, materials, human resource, ITs and outcome control feedback both positive double loop learning or negative feedback single loop learning. eTOM will be shifted towards Web 2.0 and Web 3.0 environment that tend not to thinks complexity with control all internal value network in fact not usually match with customer need and expectation. With Web 2.0 standardization firm can focus to improve or remove internal process and achieve global service standardization as value shared context among providers and customers. One of global standardization of telecom service is ethernet called Carrier Ethernet standardized by Metro Ethernet Forum (MEF) supported by Iometrix as global non profit ethernet community based on Web 2.0 movement social network business era. There are new layer of foundation in MEF/CE 2.0 that match with market driven community: Class of Services, Managed and Interconnected. All of requirements of this valuable shared context should be tested successfully by all providers to prove their have capability enough and assure Standardized Quality Of Service in value relationship global network with flexibility creating internal differentiation to win the business and grab the market. MEF move towards from rigid network element standardization and configuration to global interconnect program that more focus to service domain where all nodes of value network relationship share their know how to provide better service and customer outcomes in clear shared context as innovation process, product and services. MEF Global Interconnect Defined: “The interconnection of autonomous Carrier Ethernet networks to enable standardized and streamlined delivery of MEF-certified Carrier Ethernet services with end-to-end Class of Service, management and protection. Since 2001 when the MEF was formed, Carrier Ethernet services and networks have grown from almost zero to a US$22 billion in 2008 to US$34 billion in 2013 having a $142 billion 5-year total 2009—2013. Acheiving significant milestones along the way, the MEF’s strategy between 2008 and 2010 incorporates all elements for global Ethernet Interconnect including service levels, ENNI, management and processes such as provisioning, into place to enable Ethernet services throughout the world.